Our William Arthur Embossed Branches Personalized Wedding Invitation was designed with a garden, mountain, or woodland wedding scene in mind. We think it just might be the perfect invitation for a snowy-white destination wedding. The branch motif is deeply embossed on white Bamboo paper—creating a soft-as-snow textured invitation. 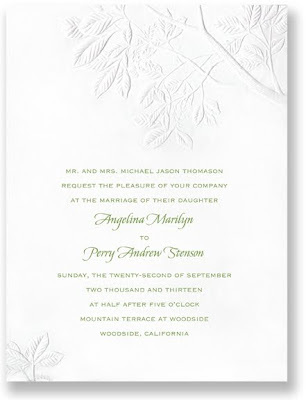 Embossed Branches is also available in matching Reception and Reply cards. PS... Wishing you a Happy New Year from snowy-white Maine!